The Stocking Frame (from Charles Deering's History of Nottingham, 1750). Before the time of Queen Elizabeth I, stockings were usually knitted by hand of very coarse woollen thread, or, if desired to be cool and elegant, they were cut out of linen, and sometimes even silk tissue. It was during her reign, in A.D 1589, that William Lee, a clergyman, then living at Woodborough in the county of Nottingham, invented the stocking frame and hoped to obtain a patent from Elizabeth but she refused because she was concerned for the country’s hand knitters. Lee was further disappointed when James I also refused him a patent and he moved to Rouen in France with his workers and his machines but here too, he met with problems with the disgrace of his sponsor, the minister Sully, and the subsequent collapse of the business. Lee died penniless in Paris in 1614, 22 years after his inventing the stocking frame. His invention ultimately proved reliable and efficient. Lee’s brother and other workers set up a framework knitting business in Spitalfields, London and a charter was granted forming the London Company of Framework Knitters. The greatest concentration of machines was in London but other areas, namely the East Midlands began to increase the numbers of machines until the roles were reversed and Nottingham and Leicester had the greater proportion of machines. By 1782 the East Midlands could boast 90% of the country’s stocking frames. The breakthrough with cotton hose came with the introduction of Jeremiah Strutt’s attachment for the frame which produced his ‘Derby rib’ in 1759. However, to overcome the problem of using cotton, which was not of a similar texture to wool or silk, new machinery and patents had to be taken out. The East Midlands was the centre of stocking frames for some considerable time. In Nottinghamshire, areas around Mansfield, Sutton-in-Ashfield, Southwell, Bulwell, Arnold, Hucknall, Nottinghham, Ruddington and Keyworth saw the rapid expansion of the domestic knitting industry. William Felkin* estimated a total of 14,879 frames were being worked in Nottinghamshire. Similarly Leicestershire (including Hinkley, Loughborough and Shepshed) and Derby and Belper and the smaller towns and villages around them also became centres for framework knitting. 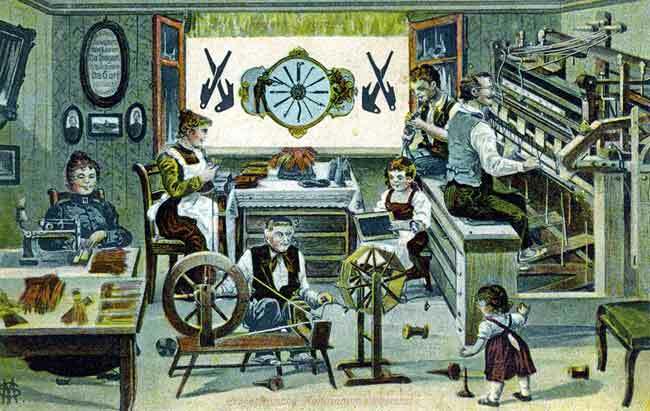 Framework knitting was a domestic industry. William Gibson, a manufacturer, gave evidence that many of his workers worked together and that it was an entirely domestic manufacture. The whole family worked in the industry. The men normally did the knitting, the women spun the yarn and finished the hose, which required needlework skills for seaming and embroidery. The work was given out through a middle person and the knitters had to accept the wage or go without work. For many they lived in abject poverty and wretchedness. The children would begin to help as soon as they were able. Ben Glover, a knitter said that the reason the children stayed in the industry was because their families were poverty-stricken; they were born to it, they remained in it and they died there! There was also the problem of unionisation which did not exist in the knitting industry. The knitters could not stop other redundant hands coming into the trade and therefore the price of labour was kept low. The family home was adapted to accommodate the machine which was placed close to the window to gain as much light as possible. Evidence of these workshops can be seen at Ruddington Framework Knitters Museum; Stapleford Road, Bramcote and Keyworth. In his evidence to the Royal Commission of 1845, William Felkin had this to say when questioned over the discrepancy of how many people were engaged in framework knitting; “ I have no doubt it arises from the circumstances of so many persons engaged in the winding and seaming for the frames (which is nearly altogether a domestic employment) so that their employment has not been considered an engagement in the manufacture of hosiery. They are the wives and children of the workmen of many cases; so whilst not and immediately engaged in the hosiery, they are so incidentally.” Because the wages were so poor for the majority of the knitters it was a necessity for the whole family to work. John Clark of Nottingham, giving evidence in 1845 stated he paid out 1s 3d for frame rent and standing (for the frame) and 3d for needles. These outgoings were the same if he worked two days or one week. John Hayward, employed 30 and 40 frames stated that the wages for young children, 12 years or so, could earn 3s 3d to 3s 6d; women were paid by the dozen and ranged between 4s 9d to 6s 3d; the men, both young and old, averaged 13s. They could work up to 15 hours a day, but usually Mondays were slack days. Issac Hayes of Lambley, who employed four frames, which he and his three children used stated that the youngest child would earn just 3s making eight or nine pairs of hose in a week. The rent would be 1s; seaming 7d; needles, winding and candles 9d a week, which left him with very little. Thomas Wright, also of Lambley told the enquiry that on average when all expenses had been paid out the weekly wage would be 5s per frame, and this only if the knitter worked at least 12 hours a day. These charges were similar in most of the areas and the different categories of framework knitters. Henry Krause of Ison (Hyson) Green, cut-up branch, using a wide frame, paid 1s 9d for frame-rent; 6d for standing; 1s for winding; 1s for taking in and 1d for oil and fat. He regularly worked from 6 am until 10pm. John Pinkett of Bulwell, making gloves from cotton, silk and cashmere believed that 9s 10d would be the net earnings of men in their prime of life. Apprentices from the parish were also used on a regular basis. The London Company of Framework Knitters tried to regulate the number of apprentices used by the masters. Samuel Fellows who came to live in Nottingham at the beginning of the 1700s defied the Company by establishing a workshop where he boarded apprentices on his frames. The parishes paid masters £5 for each boy taken off their hands. Each boy was earning about 8s a week from which 3s or 4s was deducted for his keep. A journeyman would earn between 10s and 12s so it was a profitable business for Fellows. Young girls were employed to seam gloves. Mary Hatfield, Nottingham said she employed girls as young as eight years. They worked from seven in the morning until 10 or 11 at night and could hope to earn no more than 3s 9d or 4s. Even when the men were ill they still had to pay for the rent of the frame, as John Stacey of Arnold complained that he was ill for 10 weeks and only earned 12s 3d for one dozen gloves but still had to pay 15s for the rental of the frame. The health of the knitters left much to be desired. In 1833 Dr Manson who had practiced in Nottingham for over 22 years was asked about the health of the frameworkers. His reply was that many of them were unhealthy and dyspeptic; they were pale, emaciated and thin. Felkin in the same year reported that many were ill-fed and ill-clothed, demoralised and living in extreme poverty. Again in 1845 he reported that their clothing was ragged and their homes devoid of any comforts, blaming their poverty for these conditions. The general condition of the framework knitters was deplorable. They worked from daylight until 10pm, five days a week, winter and summer on an average of 14 hours a day. Their living accommodation was described as inferior to the dwellings of the mass of workpeople in the cotton, woollen and northern coal districts; often bare in appearance. Narrow Marsh, which was a very poor, overcrowded area of Nottingham, was an area of great concentration of framework knitters. The Nottingham Review, 12 June 1829, printed a price guide of food from 1792 to 1829. In which it shows how food had increased. In 1792 a stone of flour cost 1s 10d but by 1800 it was between 6s and 7s; mutton a lb cost 4d in 1792 but had risen to 7d by 1800 and butter was 5d at the beginning of the period and 1s by 1800. The only commodity which stayed almost the same was ale per pint at 2d and 3d. The paper shows the change in the price of making cotton stockings as a 100% reduction in the price of labour from 1792 at 17s and 1829 8s. In 1837 in a letter to the Editor of the Nottingham Journal a reader outlined the outgoing expenses of a framework knitter which came to £1.2.8½d but his income was only 15s! The diets of the knitters was of basic fayre and consisted of bread, milk, butter, cheese, ale, tea and some meat. In a letter to the Nottingham Review dated 1 May 1812 and signed A Poor Stockinger the man writes that his average earnings over the past 20 months had been 12s, on which he, his wife and seven children had to live on. He had sold most of his household goods and all he had left were the bare walls. His food consisted of barley bread, old milk and potatoes. Even by 1841 things were still difficult for the knitters. In a letter to the Framework Knitters of Nottingham, the author Samuel Renshaw, showed that they were in debt by 4d, with no meat, no sugar, no small beer, no oatmeal or salt for gruel and no money for clothes. This was a practice that had gone on for many years. Edward Allen, a resident of Sutton in Ashfield had this to say to the Select Committee on Framework knitters in 1812, “It has been so common in our town to pay goods instead of money, that a number of my neighbours have been obliged to pay articles for articles, to pay sugar for drugs out of the druggist shop; and others have been obliged to pay sugar for drapery goods, and such things ... ” He also gave evidence of the employer who was not only a hosier but a grocer, miller and clothier. John Stacey of Arnold complained of his employer who, because of him not buying bread from the employer continually found fault with his work but once he started buying bread from the employer the work was not found to contain faults. William Mann stated that that all the married men received their sugar, candles, tobacco, bread and butter, bacon, cheese but not tea from the hosier who had employed him and the only money he received from him over ten weeks was 1s 3d. For many knitters having a small allotment was a means of subsidising their food rations. The 1845 enquiry makes several references to this fact. Knitters in Ruddington thought it would be a great benefit to them if they had them and the Lord of the Manor, Mr Parkyns intended to provide allotments. As in earlier times the industry became overpopulated with workers and the use of the wider frame meant that more material could be produced by an individual and many frames were superfluous to requirement. John Pinkett of Bulwell told the 1845 enquiry when asked if the number of frames had increased, “ Yes, they are regularly increasing, the reason, in my opinion, is that the bagman as soon as he gets four or five frames, with his rapacious appetite, wants more ... ” Asked if the bagman (middleman) could get enough hands to use the machines, Pinkett replied, “Yes. We all bring our children up to the same trade ... ” Another man told the enquiry that it would cost too much of their meagre income to apprentice their sons into other trades. So what could the knitters do to improve their lot? In 1799 the Combination Acts had made it illegal for men to ‘combine’ together into organised unions. 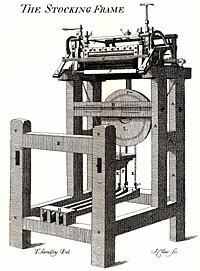 The Luddite movement which saw its zenith during 1811 and 1812 was a reaction against the introduction of the wide frames, where material was woven and then made into ‘cut ups’. The knitters petitioned the government and in 1812 a Report was compiled by a Select Committee. In the same year an emergency relief committee was distributing tickets which could be exchanged for food. The grievances of the knitters continued to grow and were not made any easier by the fact that much of the industry was dependant on overseas markets which had been disrupted because of the on-going war with France. In his evidence to the 1845 enquiry Absolom Barnett, the master of the Nottingham workhouse, suggested that there had been numerous strikes by the workmen. William Felkin commented that “General strikes have scarcely ever occurred ... their being distributed about so widely ... to say nothing of their poverty ... nevertheless partial strikes against particular masters are, even now, very common.” However he continued that he didn’t believe the men would take this course of action unless pushed to the point and that heed should be given to the representations of the men. No doubt as a means of removing themselves from their everyday grind many framework knitters enjoyed a game of cricket. He could organise his work to suit himself and his pastimes. Several went on to become county players; Horace Hind from Calverton and John William Sharpe both played for Surrey; Robert Bagguley and William Underwood played for Nottingham and Walter Price’s cricketing career was with the MCC. I would like to thank the members of the Ruddington Framework knitter’s museum and Calverton Folk museum who have helped me in this research. *William Felkin was the son of a framework knitter and was apprenticed at the age of 12 years to his grandfather, who was also a knitter. He was an apprentice during the Luddite disturbances. He became an important figure in the manufacture of lace but in 1864 his company collapsed.